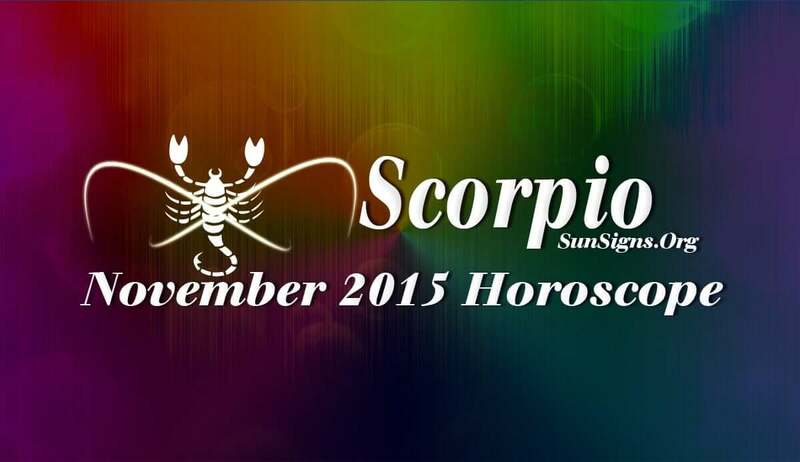 November 2015 Scorpio Horoscope predictions show that home and emotional issues are in the forefront in November 2015. Career and finance will be in the back ground. Your home will require major repairs and beautification. In November 2015, planetary strength lies in the East towards the descendant sign. This indicates confidence and independence will help you to attain your targets, the way you decide. All challenges to your progress will be overcome easily. Career growth will be excellent in November 2015 for the Scorpio zodiac sign. You have to take care of your duty towards your family along with career. Do not get into new business deals without referring to the monthly almanac. Finances will be fabulous this month for the Scorpions in spite of unfavorable alignment of planets. Progress may be slow. Your family and superiors will encourage your fiscal ventures. Problems with your colleagues and friends over finances will be resolved and future plans will work out. Consulting the 2015 Chinese astrology predictions too can give you a different opinion. The November 2015 Scorpio monthly astrology predictions foretell that singles will meet their love mates while they are trying to achieve their monetary goals. Love chases you this month and you have to just watch out for what is happening. You will shower your romantic partner with gifts and money. Lunar eclipse will bring major changes in love relationships and friendships. This might also bring some stress if you are pregnant. Health will be normal for the Scorpio in November 2015 and this is reflected in your personal appearance. You are bound to go in for some beauty treatments this month like having white teeth, or clearing of acne scars or aim to have healthy hair.